Joy McGinty has been teaching infants and toddlers survival skills and love for the water in Orlando since 1992. She built and operates SouthWest Aquatics, a state of the art facility, featuring an indoor, heated teaching pool and a ten lane, 25 yard competition pool allowing her and a staff of the most dedicated and experienced survival and stroke instructors working together to offer the finest aquatics programs available. Joy has developed a learning organization which allows this extremely talented group of teachers to consistently refine techniques and strategies while servicing hundreds of children every day. In 2008, Joy was honored by The International Swimming Hall of Fame as the recipient of the G. Harold Martin Award presented for long and exceptional leadership, insight and dedication to the water safety of children and the cause of making Every Child a Swimmer. 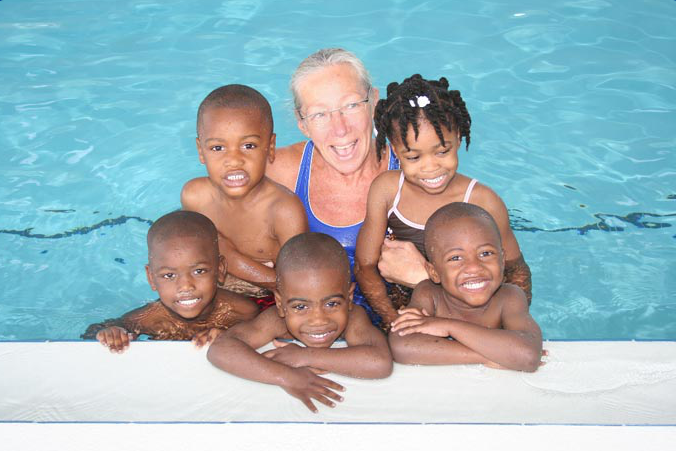 The Bank of America Neighborhood Excellence Initiative Award Committee designated Joy a 2008 Local Hero for her philanthropic work in bringing swimming survival skills to disadvantaged children. The Orange County Board of Commissioners selected Joy as The Humanitarian of the Year in 2007 for accomplishments and contributions with Orange County Head Start and underprivileged children teaching them the life-saving skill of swimming. Joy founded The Gift of Swimming in 2003, a non profit organization whose mission it is to provide access to drowning prevention resources and education for the community’s underprivileged, mentally or physically challenged or otherwise disadvantage. Thanks to a very supportive community over 1,500 children have learned to swim sponsored by The Gift of Swimming. Joy is especially proud of the Instructors she has trained who have taken these incredible skills and shared them with the children in their own communities. She is grateful to her Students, Families, Instructors, Friends and Colleagues for allowing her to live her dream everyday.